Laura Petrosian is an author of light-hearted women’s fiction who also happens to be 1/4 Armenian, although for most of her life she gave her heritage little thought. When an old friend calls, claiming she has seen a picture of Laura’s grandmother from the time of the Armenian genocide in the newspaper, she decides to delve more deeply into her family’s past and write a book completely different than anything she has written before. In 1915, Elizabeth Endicott of Boston arrives in Syria with some minimal nursing training and the blessing of the Friends of Armenia in order to help the refugees and witness and report on the genocide occurring in the Ottoman Empire. While there, she meets and falls in love with a young Armenian engineer named Armen Petrosian who lost his wife and infant daughter to the marches across the desert. Chris Bohjalian has called The Sandcastle Girls the most important book he will ever write, but it is not strictly didactic. 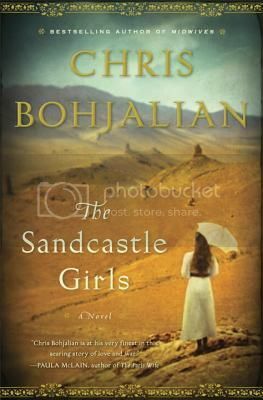 Instead, The Sandcastle Girls is beautiful and sad; Bohjalian walks a fine line, sharing the realities of the tragedies of the Armenian genocide without being too clinical or engaging in emotional manipulation. His characters are realistic, flawed but likable. Particularly impressive is how he keeps even the most minor characters – the American consul, a pair of German engineers, an Armenian woman and the orphaned girl she has taken into her heart – engaging. Their stories are interspesed with Laura, Elizabeth, and Armen’s and Bohjalian manages to do this without slowing down the story. If anything, these additional stories add richness and layers toThe Sandcastle Girls, layers that help make it such a wonderfully epic and meaningful novel. I’ve never read another work of fiction that has more completely and almost effortlessly captured the Armenian genocide of the early 2oth century. Bohjalian manages to capture both the emotional impact of the events in question as well as the facts and background, all smoothly within his narrative and without resorting to any info dumps. The Sandcastle Girlsis a truly wonderful and important novel. Very highly recommended. I completely agree! I’ve been struggling to write my review because I want to do the book justice. This is a departure for him, and I really enjoyed it. P.S. Congrats on the girls! They’re lovely. I’ve only read one Bohjalian book — The Night Strangers — but really enjoyed it. The Sandcastle Girls looks like a really interesting read! Wow. Thank you for this review! I’ve seen the cover around (it’s gorgeous), but haven’t read anything about it. I know very, very little of the Armenian genocide, and I love historical fiction for that reason – it brings events I might not otherwise know about or have a chance to learn about to the forefront. Great review. I’d really like to read this book. This has been on my radar for month…all the pre-release buzz has been amazing. Thanks for your review!!! Jen- So glad to read your review. I’ve always loved Bohjalian, and this one sounds like it’s at a level above and beyond the rest. Can’t wait to read it now, thanks! P.S. Hugs and kisses to the girls! This author’s books are always so emotional! I read Midwives, well tried to, but it was too close to when I gave birth and I couldn’t finish it. This one sounds good too. Oh, this sounds good. I have read books by the author in the past, but none of his recent stuff.